After a 4 hour coach ride from Dubrovnik to Split, and a mishap where I missed my pickup, I finally made it down to Trogir marina for the second leg of my Croatian adventure. 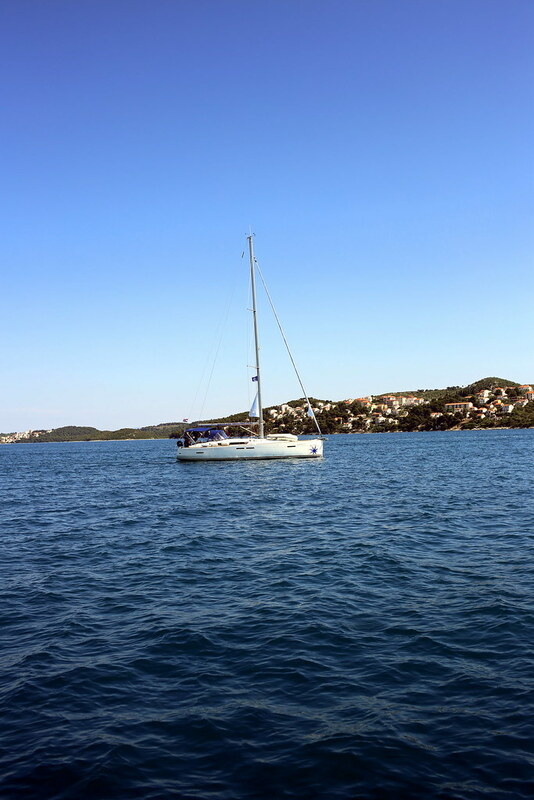 For this part I was joining the good ship Marot for a week of sailing and island hopping with Med Sailors. Now I hate to make comparisons, but I think it's fair to say most people have heard of Yacht Week. You know where you rent of boat and sail for a week? Well except Yacht week is known for less about sailing and more about the parties and piss ups. Which I'm sure is all lovely, but to be honest, when I solo travel, I don't really want the constant partying vibe. Plus I'm much more of an explorer than a drinker (I know, hard to believe sometimes) which is where Med Sailors comes in. Whether you are a group, a couple or a solo traveler, with Med Sailors you book a spot aboard a yacht for a week, where you'll be aboard with up to 8 similar minded people. How do they get similar people? Well the clever people get you to fill out a survey on likes and dislikes so you'll get the best experience possible. My boat was pretty chilled. We wanted to sail, swim and sight see, where as there was one boat we nicknamed the G&T boat as well, from dawn to dusk they drank G&T and other cocktails. I'd never done a group trip before where I was on my own. What would the people be like? Would I hate everyone and regret coming? Luckily the good old survey worked and I was placed with the loveliest bunch of people from around the world. It's a mix of ages up to about 35 and there is everyone from Aussies, Americans, Kiwi's and good old Blighty. After some quick introductions to the boat and safety when sailing, we were off. First stop was Stormoska. Whilst it's very much a holiday, it's not all play and no work. A little help on deck sailing is needed. You might remember I went island hopping around Greece in September, but that was a large Turkish Gullet and not a sailing boat. The sensation is very different. With sailing you feel alot more at one with the sea, feeling each wave as it passes under you. It's a rather glorious way to spend an afternoon. By mid afternoon we have moored at our first stop; Stormoska. A beautiful little town of white wash walls and brightly coloured shutters. It made me want to pack up my things and join the island life. Stormoska is on the island of Solta. It's a tiny fishing town of only 250 people, which does mean it's not jam packed with things to do- although there is a pub! However it's one of those places which you just want to wander and soak in the salty air. Dip you feet in the water and forget anything you left behind. I mean it really is just such a pretty town. Whilst mainly accessible by foot, there are some hidden automotive gems about. As evening drew, my group returned to the boat for welcome drinks and dinner. This far away from stress, work and good internet, it was the ideal opportunity to let go. With a week ahead looking like sun, sea and little else, I couldn't wait. One of my favorite sights is seeing the sun go down over water. The colours it casts are dazzling. And I'm pretty sure there will be many more of those moments over the rest of the week. Thanks for sharing this post! 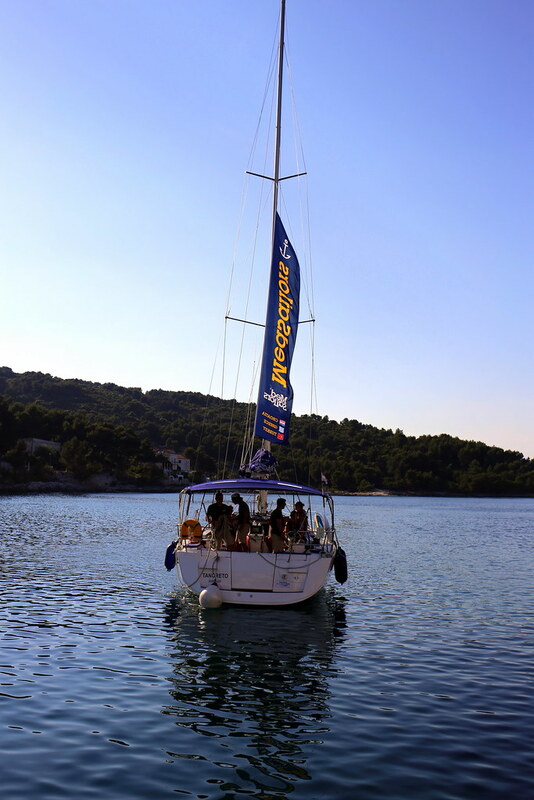 We've heard of Yatch week, but we are not party girls so this option sounds way better to us! What fun! We are definitely going for a sailing holiday before long - my husband adores boats! wow,,,,,, beautiful place,, love to stay !!! I would love to be there and enjoying sailing, its not only my passion by profession also and I would love to devote my complete day to this amazing act.